Atomic theory is a common topic throughout any introductory chemistry course. Regardless of the depth given to the various models and the evidence that led to their creation, it’s likely that Rutherford’s gold foil experiment gets at least some attention in your course. For me, this topic had always been a bit more lecture-based. Even though I thoroughly enjoyed talking about the history and development of the atom, I didn’t like the feeling of being heavily reliant upon lecture. Additionally, I didn’t like the fact that I wasn’t providing students with an opportunity to generate their own evidence to support the concepts and models that I wanted them to develop. 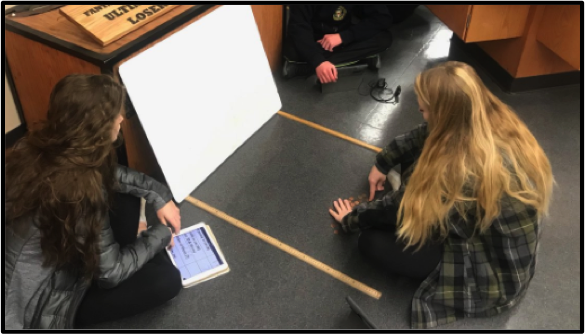 In this post, I propose a simple activity that gives students an opportunity to replicate Rutherford’s experiment through an analogy experiment that may allow for easier conceptualization of the experiment itself and provide additional support for model development. 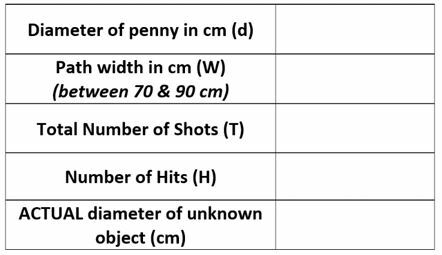 Indirectly calculate the diameter of an unknown object by recording the number of times it is hit with objects of a known diameter. The key idea here is to emphasize the fact that they will be determining the diameter of something indirectly. All students understand what they would do if I asked them to determine the diameter of a circular object placed in front of them—simply measure it. But what if they were not able to see the object? Obviously this complicates things a bit. This provides a nice opportunity to discuss how often (especially in chemistry) we rely on indirect evidence to help us inferences about the primary claim that is being made. The experimental setup (figure 1) and the materials needed are simple. Each group receives two meter sticks, 20 pennies, a whiteboard, and an object with a circular bottom. Typically, I give the groups full water bottles to ensure they have enough mass, but you can use different items with a variety of sizes (film canisters, water filled beakers...). Figure 1: Side view of experimental setup (left). Top view of experimental setup (right). One person in the group is designated as the “penny shooter.” While the other members of the group are getting set up, the penny shooter is told to wait out in the hall to avoid knowing the location of the unknown object. Ideally, we want the penny shooter to be unaware of the location of the object to limit the possibility of intentionally shooting pennies directly at the object. In this past, I have tried to decrease this bias even more by blindfolding the penny shooters and allowing them to wear headphones with music playing on full volume. Needless to say, students fight over who gets to be the penny shooter. The other member(s) of the group have a few simple tasks before and during the experiment. As seen in figure 1 above, students will establish the path by laying down two parallel meter sticks between 70 – 90 cm apart. Place the whiteboard on top of the meter sticks so it is just barely above the ground and can easily lean against a wall, desk, or lab table. Though the figure above suggests leaning it against a wall, it is easier for the group if the whiteboard can lean against something that does not allow pennies to come back unless they hit the unknown object. Once the whiteboard is secure, place the object somewhere behind the whiteboard. Do not place the object directly next to the meter sticks. Before they tell the penny shooter to come in, ensure that a penny can slide under the whiteboard and that the object cannot be seen from the shooter’s perspective. Record the number of times the object is hit. Ensure a clear path for the pennies (i.e. if a penny hits and then comes back, remove it from the path). Once a round is over, collect the pennies and hand them back to the penny shooter for the next round. Once they have all the necessary data, I provide them with the equation below, which will allow them to calculate the experimental diameter of their unknown object. Personally, I decide to give them the equation above simply to save time. However, I can imagine some teachers possibly adding a layer of depth to the investigation by having students derive the equation themselves. Once students have calculated the experimental diameter of the unknown object, they are asked to compare it to the known diameter. Though results will vary, several groups often get within 1 – 1.5 cm of the known diameter—pretty cool! From this experience, students gain insight as to how it is possible to determine the size of an object that cannot be seen. Lastly, I provide four extension questions for each group to answer. Each question is meant to get students thinking about some of the inferences that will soon be made once we start talking about Rutherford’s experiment. If you were the one firing the pennies while doing the same experiment and you noticed that some of your pennies actually bounced back toward you, how would you interpret this observation? What would this suggest about the mass of the unknown object relative to the penny? If you knew that your penny had a positive charge and you witnessed the same effect, what could you conclude about the charge of the unknown object? Why did the majority of your pennies not hit the unknown object? Once we eventually get to discussing Rutherford’s experiment, it is fun to see students make the connections between his experiment and our analogy. I will often hear things like, “Oh, so the alpha particles were just like our pennies!” and other statements describing the similarities between the nucleus and unknown object. Even the realization as to why the majority of pennies did not make contact with the unknown object being similar to the majority of alpha particles going straight through the gold foil is a cool one to hear. I believe having this experience prior to discussing Rutherford’s experiment provides a strong foundation for our students to more easily connect the rather conceptual findings from Rutherford’s experiment. I feel it is better than simply discussing the details of Rutherford’s experiment head on and assuming everyone will just “get it.” When teaching such abstract concepts in chemistry, the more connections we can allow our students to make with previous experience, the easier they will be able to assimilate such experiences with the appropriate concept. About 30 minutes before the discussion. two meter sticks, 20 pennies, a whiteboard, and an object with a circular bottom (water bottle, soup can, etc). Have students complete the procedure below and answer the questions before discussing the theory that Rutherford came up with based upon the results of his gold foil experiment. When logged on to your ChemEd X account you will find the procedure in the Student Document included in the Supporting Information below. Gather the materials and provide the goal of the experiment to students. I do not remember where I heard about this activity initially, but I have been using some form of it since very early in my career. I have seen a variety of versions online.